Stephon Clark, an unarmed twenty-two-year-old African-American, was shot and killed on March 18, 2018, by Sacramento police who had earlier received reports that someone was breaking car windows and hiding in a backyard. Two officers saw Clark in a neighbor’s backyard and chased him into his grandmother’s backyard. After ordering him to raise his hands, not even a second elapsed before the police opened fire on Clark, purportedly believing he had a gun.3 But Clark did not have a gun. He had an iPhone in his hand, and the police shot at him twenty times. This incident has sparked nationwide outrage because of the extreme and excessive response of police to the report. A police helicopter was sent for a routine report of vandalism, the police did not give Clark a chance to put his hands up, and then after shooting Clark, they delayed in calling for medical assistance. But police actions after the shooting are perhaps the most disturbing part of the story. About seven minutes after the shooting, the officers muted their body cameras and animatedly talked amongst themselves,4 creating suspicion of a coverup. The investigation into this incident is ongoing, but the evidence suggests an egregious use of excessive force by police. How can a cellphone be mistaken for a gun? And even if it were a gun, police gave Clark no real chance to put his hands up and demonstrate he was not a threat. The high number of police-inflicted injuries is not surprising considering how widespread training that instills a “warrior mindset” in law enforcement officers has become, leading police to look upon “every individual they interact with as an armed threat and every situation as a deadly force encounter in the making.”12 This type of mentality transforms everyday citizens into enemy combatants in the eyes of law enforcement, and as a result, some police officers feel little concern for the rights of those individuals with whom they interact. In a state in which public officials are more focused on maintaining order than upholding the Fourth Amendment, it is imperative that we know our own rights when it comes to the potential use of excessive force. Q: What law protects me against being harmed by police? A: Under the United States Constitution, citizens are protected from unnecessary police violence and are allowed to sue for injuries they sustain as a result of such violence. In fact, the Fourth Amendment’s protection against “unreasonable searches and seizures” applies whenever police employ excessive force in the course of conducting an investigation or arresting a person.20 When police go too far and use unnecessary force against a person, they violate the person’s constitutional protection against unreasonable seizures. Q: What amount of force used by police is considered excessive and violates my Fourth Amendment rights? There are no hard and fast rules on what police actions constitute excessive force, and the same action may be reasonable in one case and not in another. For example, handcuffing a person would not be considered excessive force if the police are searching an area where they reasonably believe dangerous weapons may be present.22 On the other hand, handcuffing is considered excessive if police don’t have any reason to suspect a person of a crime and are investigating a matter, such as a missing person, that does not involve a risk of violence.23 Each case involves an examination of the amount of force used by the police and their reasons for using the said amount of force. Q: If police use force upon me in the course of an arrest, are they violating my rights? Q: If police have probable cause to make an arrest, does that mean they do not violate the Fourth Amendment if they injure the person they arrest? Q: Are police allowed to use any level of force in order to stop and apprehend a fleeing suspect? Q: Are police required to stop other police officers who are using excessive force? 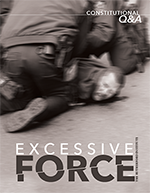 Q: What can be done to reduce the number of incidents in which police utilize excessive force? There are alternatives to these training practices, including the de-escalation tactics that both Chicago and Salt Lake City police teach in their police training. The Chicago Police Department requires training that promotes conflict de-escalation and the “sanctity of life.”35 The Salt Lake City Police Department’s approach to de-escalation involves “more voice commands from the officer and the slight giving and taking ground with a suspect to buy time.”36 These tactics have led to a decrease in deadly shootings, with no fatal officer-involved shootings in Salt Lake City since September 2015.37 These tactics are a non-lethal alternative to deadly force on fleeing persons, as they involve more dialogue between the officer and the citizen. They also emphasize officers leaving space between themselves and the citizen and staying near cover to promote their safety. Q: What are our leaders doing to prevent the use of excessive force by police? A: The disturbing trend of inaction in the face of the growing problem of police violence against citizens is not limited to the courts. As shown by the recent actions of the United States Justice Department, very little is being done at any level of government to address the systemic conditions and failures that have led law enforcement agencies to act like occupying armies in their treatment of citizens.38 Any reform will only happen if citizens stand up for their constitutional right not to be victims of excessive force and demand their representatives protect their rights. Q: What kind of injuries can a person recover for in an excessive force claim? Virtually any police action or equipment used to stop and hold a person can be used in a way that gives rise to an excessive force claim. A claim may be based on the manner in which the officer grabs and holds a person.41 Handcuffing,42 using a taser,43 deploying a police dog,44 chasing or stopping a vehicle,45 or pointing a gun at a person46 may be the basis for a claim for excessive force. Q: If I witness or am victim to excessive police force, am I allowed to record officers for evidential purposes in an excessive force claim? Q: If I am injured by a police officer, what are my legal options? Q: What obstacles exist that prevent excessive force claims from succeeding? A: Lawsuits brought by citizens that seek money damages for injuries inflicted by police officers serve a valuable role in preventing use of excessive force by police. If police know that they face personal liability if they act aggressively and injure citizens, it is likely that they would be more careful and less violent in the way they treat citizens. This includes the way police use the increasingly dangerous weapons they have at their disposal. Moreover, the cities and towns that employ police have an incentive to properly and effectively train officers to limit their use of force because a failure to train police properly may result in the city or town being held responsible for the injuries inflicted by police. Unfortunately, the courts have created obstacles to recovery on excessive force claims, thereby reducing the deterrence such claims have on police violence. Not only does a citizen have the burden of proof on the claim, but courts have held that the citizen must show that a police officer’s use of force was “clearly excessive” and “clearly unreasonable.”52 Courts also hold that police must be given allowance for having to make split-second judgments,53 even if this might not have been the actual circumstances of the case. And even if there is evidence that the officer intended to maliciously inflict injury or was motivated by racial hatred against the victim, this cannot be considered in determining the officer’s liability.54 Thus, if a citizen does get his case tried by a jury, that jury is basically instructed to give the benefit of the doubt to the police officer. Q: What should I do if I believe police used excessive force against me? A: If you believe your rights were violated in the manner police treated you, you first should try to obtain the proof that will be needed to support an excessive force claim against the officer. Many police departments now video record interactions between police and citizens with body cameras or dash cameras mounted on police vehicles. Thus, there is a very good chance the encounter with police was recorded. At the earliest opportunity, you should obtain a copy of any recordings using the state and local freedom of information laws. You should also seek medical assistance and an examination at the earliest opportunity in order to get treatment and to assure that the extent of your injuries is documented. It also is important to consult with an attorney as soon as possible to help you in obtaining and preserving crucial evidence. Just last year, The Rutherford Institute won a settlement for a Texas man who was handcuffed and thrown to the ground by police for refusing to consent to a warrantless search of his house.58 Currently, The Rutherford Institute is suing a Virginia county for using a tactical team of heavily-armed officers to arrest a man who police knew had committed no crime and posed no threat to the public.59 After launching a flash grenade at the man’s truck, police smashed the driver-side window, dragged the man out by his arms, handcuffed, searched and arrested him. And in November 2017, Institute attorneys filed a lawsuit on behalf of a young African-American man who, after being stopped by Louisiana police for a broken taillight, was thrown to the ground, beaten, arrested, and hospitalized for severe injuries to his face and arm, all for allegedly “resisting arrest” by driving to a safe, well-lit area before stopping.60 For over a quarter century, we have assisted, without charge, persons deprived of their liberty by government officials. 1 The Rutherford Institute, a national nonprofit civil liberties organization, is deeply committed to protecting the constitutional freedoms of every American and the integral human rights of all people through its extensive legal and educational programs. The Institute provides its legal services at no charge to persons whose constitutional and human rights have been threatened or violated. The Institute’s mission is twofold: to provide legal services in the defense of civil liberties and to educate the public on important issues affecting their constitutional freedoms. 2 “Former Police Chief Has A Plan For ‘How To Fix America's Police,’” NPR (Jul. 10, 2016), http://www.npr.org/2016/07/10/485460453/former-police-chief-has-a-plan-for-how-to-fix-americas-police. 3 “The Death of Stephon Clark: What We Know about the Sacramento Police Shooting,” ABC News (Mar. 29, 2018), http://abcnews.go.com/US/death-stephon-clark-police-shooting/story?id=54039443. 5 Frank A. Baker v. Brian Ficcadenti, et al., Case No. 0:17-cv-00496-RHK-DTS, U.S. Dist. Ct., Dist. of Minn., Complaint [Doc. 1], filed Feb. 17, 2017. 6 Laurel Wamsley, “Utah Nurse Arrested for Doing Her Job Reaches $500,000 Settlement,” The Two-Way: Breaking News From NPR (Nov. 1, 2017), http://www.npr.org/sections/thetwo-way/2017/11/01/561337106/utah-nurse-arrested-for-doing-her-job-reaches-500-000-settlement. 7 Lincoln v. Turner, 874 F.3d 833, 838 (5th Cir. 2017). 8 Cleve R. Woodson, Jr., “Video shows and officer slamming, then pummeling a black man accused of jaywalking,” The Washington Post (April 12, 2017), https://www.washingtonpost.com/news/post-nation/wp/2017/04/12/video-shows-an-officer-slamming-then-pummeling-a-black-man-accused-of-jaywalking/?utm_term=.b94b7c751b33. 9 John R. Vile and David L. Hudson, eds., Encyclopedia of the Fourth Amendment, at 245 (2013). 10 Elinore J. Kaufman, David. N. Karp, and M. Kit Delgado, “US Emergency Department Encounters for Law-Enforcement-Associated Injury, 2006-2012,” JAMA Surgery (April 19, 2017), http://jamanetwork.com/journals/jamasurgery/article-abstract/2619243. 11 Bureau of Justice Statistics, Arrest-Related Deaths Program Redesign Study, 2015-16: Preliminary Findings, (Dec. 2016), https://www.bjs.gov/content/pub/pdf/ardprs1516pf.pdf. 12 Seth Stoughton, “Law Enforcement’s ‘Warrior’ Problem,” 128 Harv. L. Rev. F. 225 (April 10, 2015), https://harvardlawreview.org/2015/04/law-enforcements-warrior-problem/. 13 Taylor Wofford, “How America’s Police Became an Army: The 1033 Program,” Newsweek (Aug. 13, 2014), http://www.newsweek.com/how-americas-police-became-army-1033-program-264537. 15 Sheryl Gay Stolberg and Eric Lichtblau, “Sweeping Federal Review Could Affect Consent Decrees Nationwide,” New York Times (April 3, 2017), https://www.nytimes.com/2017/04/03/us/justice-department-jeff-sessions-baltimore-police.html?. 16 See, e.g., Reichle v. Howards, 132 S. Ct. 2088, 2093 (2012) (person suing a police officer for violating the Fourth Amendment must not only show that actions of police violated the constitution, but also that “every reasonable official would have understood that what he is doing violates that right”). 17 John W. Whitehead, “Shielded From Justice: The High Cost of Living in a Police State,” The Rutherford Institute (Oct. 14, 2014), https://www.rutherford.org/publications_resources/john_whiteheads_commentary/shielded_from_justice_the_high_cost_of_living_in_a_police_state. 18 Kisela v. Hughes, 138 S. Ct. 1148 (2018). 19 Kisela v. Hughes, 138 S. Ct. at 1162 (Sotomayor, J., dissenting) (internal quotations omitted). 20 Graham v. Connor, 490 U.S. 386, 395 (1989). 21 Graham v. Connor, 490 U.S. 386, 396 (1989); Goldman v. Williams, 101 F. Supp. 3d 620, 648 (S.D. Tex. 2015). 22 Muehlet v. Mena, 544 U.S. 93, 99-100 (2005). 23 Lundstrom v. Romero, 616 F.3d 1108, 1123 (10th Cir. 2010). 24 Tolan v. Cotton, 134 S. Ct. 1861, 1866 (2014). 25 Tennessee v. Garner, 471 U.S. 1, 11 (1985). 26 See, e.g., Chacon v. Copeland, No. 12-CA-226, 2015 WL 2018937 (W.D. Tex. Apr. 30, 2015) (police used excessive force in violation of Fourth Amendment where, after arrestee pulled away from one officer, police threw arrestee to the ground and shot him several times with a taser). 27 Scott v. Harris, 550 U.S. 372, 384 (2007). 28 Tennessee v. Garner, 471 U.S. 1, 11 (1985). 29 Tennessee v. Garner, 471 U.S. 1, 11 (1985). 30 Brosseau v. Haugen, 543 U.S. 194, 200 (2004). 31 Scott v. Harris, 550 U.S. 372, 384 (2007). 32 O'Neill v. Krzeminski, 839 F.2d 9, 11 (2d Cir. 1988). 33 Seth Stoughton, “How Police Training Contributes to Avoidable Deaths,” The Atlantic (December 12, 2014), https://www.theatlantic.com/national/archive/2014/12/police-gun-shooting-training-ferguson/383681/. 34 Christopher Smart, “Instead of Shooting Suspects, Utah Police Are Training to De-Escalate Violence,” The Salt Lake Tribune (September 18, 2016), http://www.sltrib.com/home/4334493-155/instead-of-shooting-suspects-utah-police. 35 Kate Shepherd, “New Use-Of-Force Policy Bans Cops from Shooting Fleeing Suspects Unless There’s an Imminent Threat,” Chicago Reader (May 18, 2017), http://www.chicagoreader.com/Bleader/archives/2017/05/18/new-use-of-force-policy-bans-cops-from-shooting-fleeing-suspects-unless-theres-an-imminent-threat-and-other-chicago-news. 36 “FOX13 Exclusive: when police can use deadly force, but don’t,” FOX13 News (May 17, 2017), http://fox13now.com/2017/05/16/deadly-force-or-de-escalation/. 37 “Salt Lake City Police Are Working to End Fatal Officer-Involved Shootings,” H-11 Digital Forensics (Feb. 18, 2018), https://h11dfs.com/salt-lake-city-police-are-working-to-end-fatal-officer-involved-shootings/. 38 Jefferson Morley, “Sessions Giving Free Reign to Police Departments, Destroying Years of Work by Obama to Reform Violent Practices,” AlterNet (April 4, 2017), http://www.alternet.org/news-amp-politics/jeff-sessions-war-good-policing., and Matt Zapotosky and Wesley Lowery, “Justice Department will not charge Baton Rouge officers in fatal shooting of Alton Sterling,” The Washington Post (May 2, 2017), https://www.washingtonpost.com/world/national-security/justice-department-will-not-charge-baton-rouge-officers-in-fatal-shooting-of-alton-sterling/2017/05/02/ac962e66-2ea7-11e7-9534-00e4656c22aa_story.html?utm_term=.98285c526a39. 39 Holguin v. Lopez, 584 F. Supp. 921, 927 (W.D. Tex. 2008). 40 Baird v. Renbarger, 576 F.3d 340 (7th Cir. 2009). 41 Holguin v. Lopez, 584 F. Supp. 2d 921, 927 (W.D. Tex. 2008). 42 Lundstrom v. Romero, 616 F.3ed 1108, 1123 (10th Cir. 2010). 43 Myers v. Baltimore County, Md., 713 F.3d 723, 733 (4th Cir. 2013). 44 Marley v. City of Allentown, 774 F. Supp. 343 (E.D. Pa. 1991). 45 Brower v. Inyo, 489 U.S. 5583 (1989). 46 Jacobs v. City of Chicago, 215 F.3d 758 (7th Cir. 2000). 47 “Know Your Rights: What to Do If You Are Stopped or Detained for Taking Photographs,” ACLU, https://www.aclu.org/know-your-rights/photographers-what-do-if-you-are-stopped-or-detained-taking-photographs?redirect=know-your-rights-photographers. 48 42 U.S.C. § 1983. When law enforcement officers of the U.S. government are involved, the lawsuit is brought under a court decision allowing claims for constitutional violations by federal officials. Bivens v. Six Unknown Named Agents, 403 U.S. 388 (1971). 49 Zuchel v. City and County of Denver, Colorado, 997 F.2d 730 (10th Cir. 1993). 50 Renk v. City of Pittsburgh, 537 Pa. 68, 641 A.2d 289 (1994). 51 Smithart v. Towery, 79 F.3d 951 (9th Cir. 1996). 52 Tarver v. City of Edna, 410 F.3d 745, 751 (5th Cir. 2005). 53 Graham v. Connor, 490 U.S. 386, 397 (1989). 54 Graham v. Connor, 490 U.S. 386, 397 (1989). 55 Anderson v. Creighton, 483 U.S. 635 (1987). 56 Salazar-Limon v. City of Houston, Texas, No. 16-515 (U.S. Sup. Ct. April 24, 2017), slip op. at 8-9 (Sotomayor, J., dissenting). 57 Kisela v. Hughes, 138 S. Ct. 1148, 1162 (2018) (Sotomayor, J., dissenting). 58 Dantzler v. Hindman, No. 1:15-CV-1084-DAE, 2017 U.S. Dist. LEXIS 218478 (W.D. Tex. Sept. 1, 2017). 59 Burruss v. Riley, 192 F. Supp. 3d 655 (W.D. Va. 2016). 60 Gregory Tucker v. City of Shreveport, No. 5:17-cv-01485-EEF-KLH, W.D. La.